Keep Colds At Bay The Plant-Based Way! So, if you’re in this hemisphere, you’ll know it’s winter. And if you have to travel by public transport every day like I do, you’ll have had the pleasure of dodging the sneezes and splutters of fellow travellers for a few months now. Maybe you’ve been the offender? Hell, it’s the best way to get a seat right? On a train the other day, someone actually sneezed ON MY HEAD. I was sitting down, and as there were no seats left a girl was standing over me, holding on to my seat and reading her phone. I heard her sneeze build-up and didn’t sweat it too much as I assumed she would turn her head and the, um, sneeze rain (?) would land well away from me. Instead she stayed where she was and put her hand over her nose. This would have been fine except the sneeze escaped from under her hand and landed on my head. Yes. The sneeze rain settled, droplet by droplet, On. My. Head. Have you ever been laying on your back in yoga in the relaxation position, been caught off guard by a sneeze, and then felt the fine mist slowly land on your face? Me neither (Just kidding!) This felt similar, but on my scalp. I may wear a rain hat for the rest of the winter. Needless to say, I didn’t know what to do with this. I sat with it for a while, and then decided to erase it from history. Then I got off the train at Streatham Hill. What am I leading to? Well, I’m pretty sure you’ve had similar experiences at some point this season, and in order to avoid catching the lurgy it’s a good idea to give our immune systems a little help at this time of year. This is a no-brainer, but I’m still gonna say it, dammit. Include more than ever lots of green leafy veg and plenty of citrus fruit in your diet. The clementines and navel oranges around at this time of year are vitamin C bombs and I’m positive they were invented for us public transport users. Eat them. Eat them on the train too. I love it when someone cracks open an orange on the train – it smells divine, and makes me want one too. As we learned in this post, keep up the health of your gut, as this is the majority of your immune system. 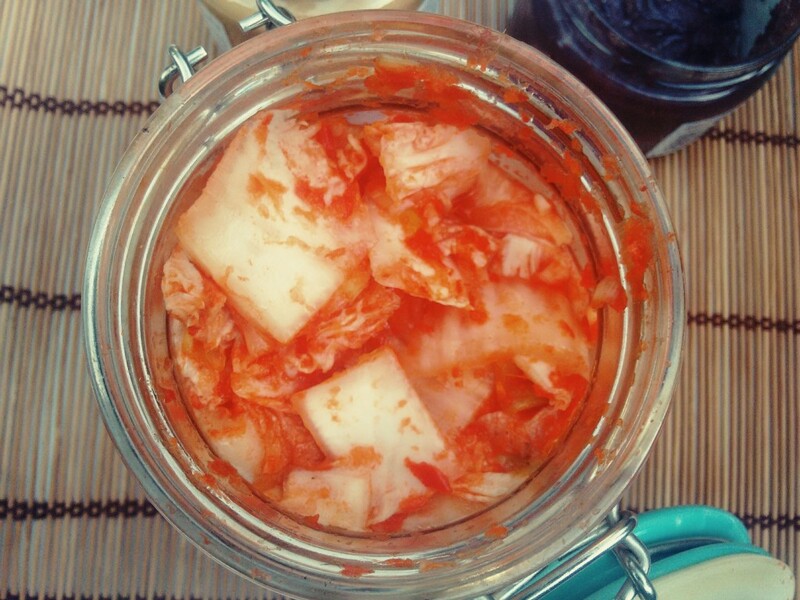 Make sure to eat some kimchi or sauerkraut several times a week, or at the very least, take a non-dairy probiotic every day throughout winter. Garlic is your best friend in winter. It is good for your immune system by helping keep your gut in order, but on top of that it has anti-bacterial and anti-viral properties and is a potent anti-inflammatory. You can crush it and put it in dishes at the end of cooking, and it will do it’s darndest to prevent you getting sick. These next two are based on empirical evidence solely. I know they work for me, and that they will not harm you should you decide to try them (as indicated) too. There is a product called Citricidal (GSE in the US). It is grapefruit seed extract, and a very powerful anti-viral, anti-biotic, and anti-fungal. If I’ve been travelling with lots of sniffly commuters, when I get home I put 2 drops of Citricidal in about a whiskey shot amount of water, and stir. I then take a cotton bud, dip one end it in the water and then swirl it around one nostril, then do the same with the other end in the other nostril, all the while sniffing slightly, so a tiny bit goes up my nose. I also do this before embarking on a plane journey, and it truly seems to keep me free from the lurgy. If I feel like I have the first signs of a cold – the bone-ache, the slightly swollen feeling in the back of the throat etc, then I take half an umeboshi plum. If you don’t know these already, they are salted Japanese plums (available in health stores) and are the sourest little mofo’s you ever did taste – and that’s the point. They are extremely acidic, but they have an alkalising effect once in the body. And as you may be aware, the more alkaline your body is, the less disease it can harbour. If I remember to take half a plum in time, the cold-feelings are gone by the next day. Just remember to take a couple of mouthfuls of water afterwards, to rinse excess acid from your teeth. If they are too sour for you to eat as they are, then you can mash half a plum and stir it into some cooked brown rice. This actually flavours the rice nicely, and kids like it too. They are around ten pounds for a jar (around fifteen bucks in the US? ), but if you only take them when you need them, they last an absolute age. May the rest of your winter be cold free! Author Karen (Vegan Coach)Posted on January 26, 2014 December 17, 2018 Categories UncategorizedTags garlic, gut-health, immune system, winterLeave a comment on Keep Colds At Bay The Plant-Based Way!